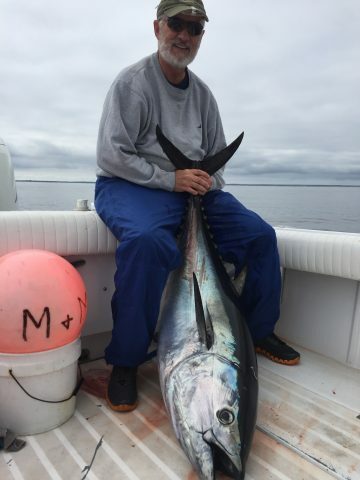 Bluefin Tuna are by far the largest (up to 10+ feet) and fastest (40+ MPH) fish in Cape Cod waters. They are the ultimate angling challenge. 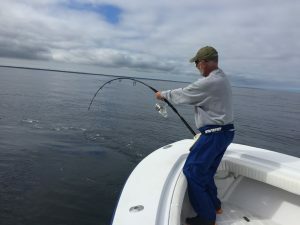 We pursue them using a variety of fishing techniques including casting/jigging with heavy spinning equipment and trolling and drifting live baits on two-speed stand-up rods. When the fish are on the surface attacking schools of bait we can “run and gun” hoping to place the perfect cast in front of a fast-moving school. Strikes are savage and the ensuing battle can sometimes last for hours. When the fish are deeper in the water column we jig and send live baits down to entice them. Top-of-the-line fishing gear is an absolute necessity and we have nothing but the best on the Dragonfly. 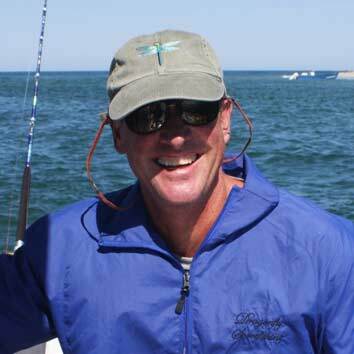 The Prime times for Bluefin Tuna fishing charters are late August through October. Favorite spots to target these fish include Cape Cod Bay, Stellwagon Bank and the waters of the Atlantic east of Chatham.